I hate waste. I realize that hate is a strong word, but I hate waste. There are a lot of reasons behind it, but the truth is that wasted food or other items amount to wasted money, wasted time and wasted effort. Instead, I prefer to reuse things to save money in anyway that I can, to stop buying and make things homemade instead and to save that time, money and effort anyway that I can. Frankly, I am a busy Mom with 2 teenage girls, an extremely hard working man, the dog, the cat they want to add to the family who runs not one but two very busy companies; I don’t have time to bother with waste. Instead, I do what I can; things such as learning how to make recycled crayons at home; to save time and money. Now obviously, with two 13-year-old girls in the house, we don’t use a lot of crayons these days, but when my Emma was younger, the amount of broken crayons that graced my living room floor was astounding. It seemed like every box of crayons I bought would end up broken on the floor within a day or so which meant I was buying a lot of crayons. 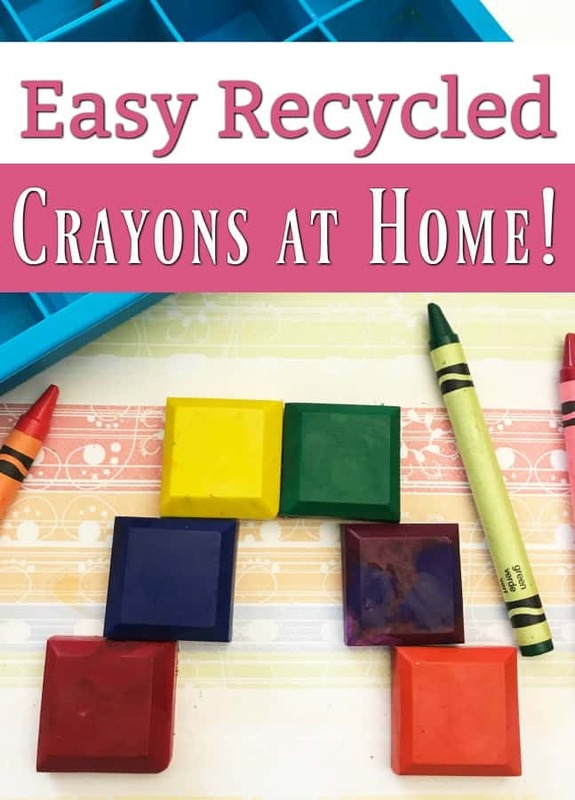 Luckily, I learned how to make recycled crayons at home before too long and was able to save myself a pretty decent amount of money on those replacement boxes and to take a step toward having a no waste home at the same time. If making upcycled crayons at home seems complicated, I promise you it isn’t. You only need a handful of supplies and a few minutes of time. 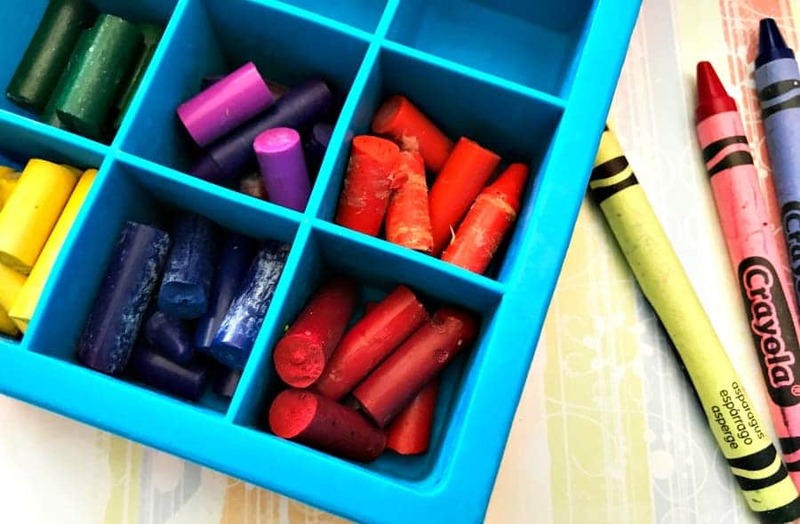 Your kids will love that you’re able to “fix” their broken crayons and make them into something new and you will love that you’re able to save a little bit of money on the side. One other thing; you can also use this method to make shaped crayons at home. You would follow the instructions and use a shaped silicone mold instead of the square silicone mold we used for this post. Broken Crayons in any color that you want – You will need several of each color in order to get a final product that is thick enough. To start, soak your broken crayons in a small mixing bowl of ice water for 20-30 minutes. This will loosen the papers around the crayons making them easier to remove. 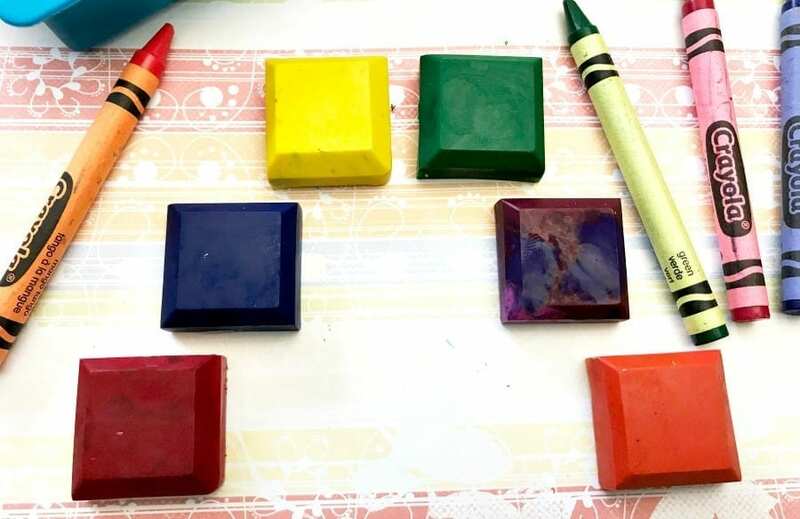 Once you have all paper removed, preheat the oven to 300°F, pat the crayons as dry as you can get them then separate your crayon pieces by color in your silicone ice cube tray. Use one square for each crayon color unless you are trying to make color swirl crayons. Bake the broken crayon pieces for 8-12 minutes at 300° F or until they’re fully melted. Once they’re fully melted, remove them from the oven and set aside to cool completely before trying to remove them. Be very careful; especially if you’re letting your littles help. You’ll be dealing with melted wax which can burn very badly if you spill it on skin. 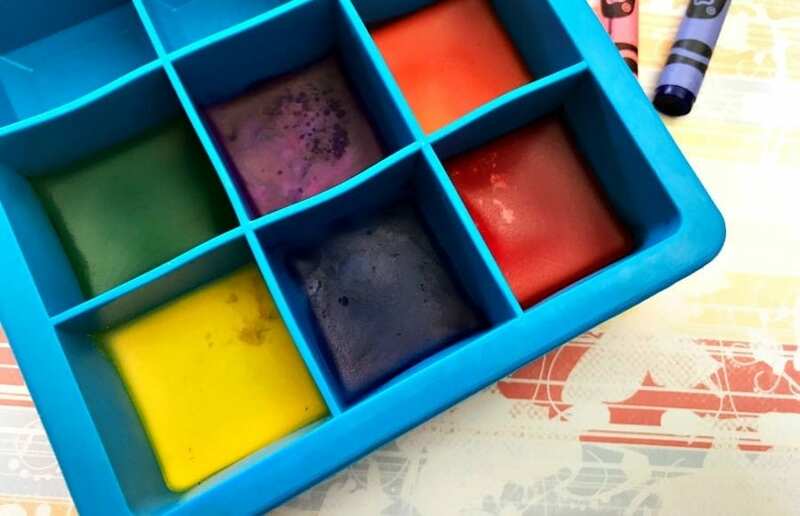 Once the crayons have cooled completely, pop them out of the silicone mold. You’re ready to color with your “new” recycled crayons! Grab yourself a new coloring book and have fun!